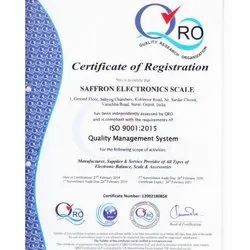 Founded in the year of 2001, we "Saffron Electronics Scale" are leading Manufacturer, Trader, and Supplier of High Quality (EMFC) Electro Magnetic Force Compensation weighing balance & scales in India. Our technology based on - Cutting edge, Brilliant DLMWC (Double Lever Monologue Weighing Cell) - invented by German technocrat. This unique system offers unbeatable advantages for daily use like Incredibly fast response, more sensible accuracy, high stability, and Unfailing reliability. Saffron scales Provides Complete Range of Analytical Balances, Precision Balance, Platform Scales, Laboratory Weights, Table Top Scale, Jewelry Weighing Scales, Diamond Weighing Balance and much more. All our products are procured from renowned firms of the market. The products offered by us are widely appreciated in the market for having features like optimum performance, reliability, accurate results, user-friendliness, and low maintenance cost. Moreover, for meeting the diverse needs of clients, we offer our products in variegated sizes, models, and specifications. Our Company was established in the year 1999 as an indenting company & we have an extensive variety of Weighing scales that are characterized by high efficiencies and complete reliability in service. Saffron Scale has a team of highly qualified & experienced engineers for guaranteed better weighing results throughout the life cycle of your balances. We are committed to offer high-performance balance & ensure customer satisfaction. Association with renowned firms of the Industries. Right from the day one of our commencement, providing supreme quality products to the clients has been of prime importance for us. Due to this, we source all our products including Micro Balances, Analytical Balances and Jewelry Balances from renowned manufacturers, who are known for their supreme quality products. A team of quality examiners is hired by us for ensuring that only those products are dispatched to the clients, which are flawless. This team examine each procured product on certain standards for making sure that no error has taken place in them during transits.